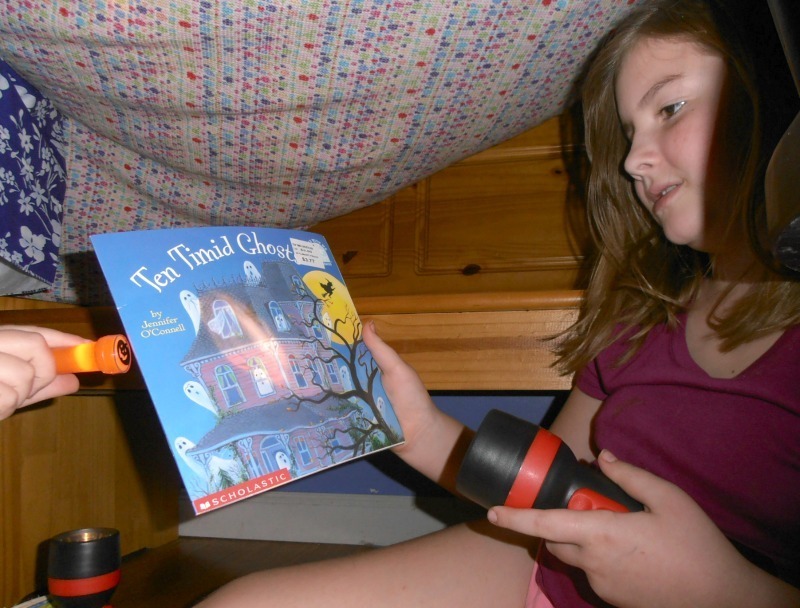 It's easy to plan a spooky sleepover with a Scholastics story and EVEREADY® Gold batteries in your flashlights! 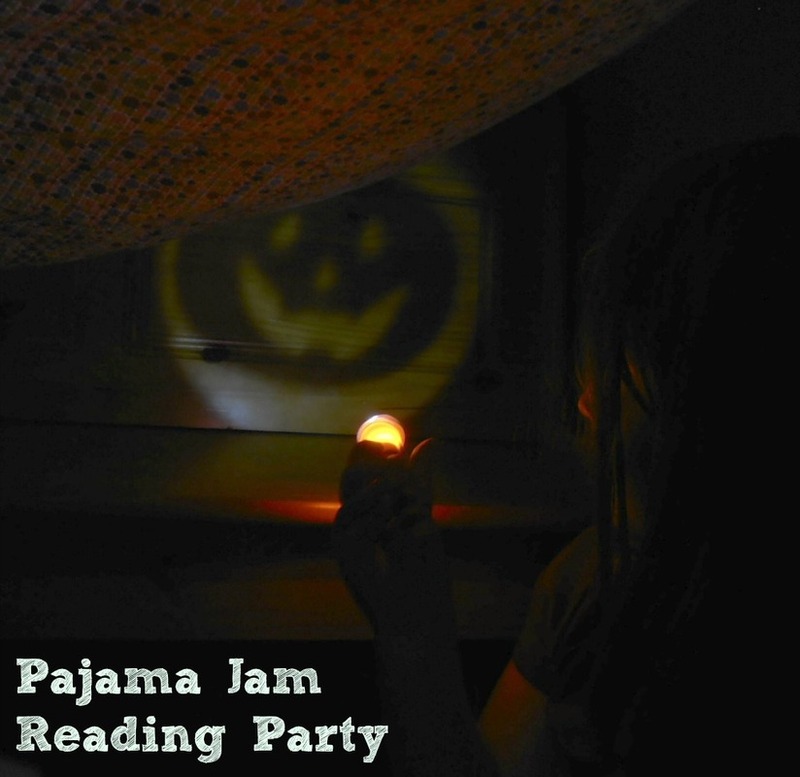 We decided to plan our spooky pajama party around fun Halloween books for kids! "We picked some fun spooky books and decided on a Candy Corn S'more Recipe as the perfect companion snack! 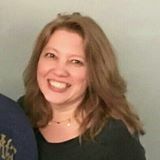 There was an Old Lady who Swallowed a Bat" by Jared Lee, "Splat the Cat" by Rob Scotton, and "Ten Timid Ghosts" by Jennifer O'Connell. 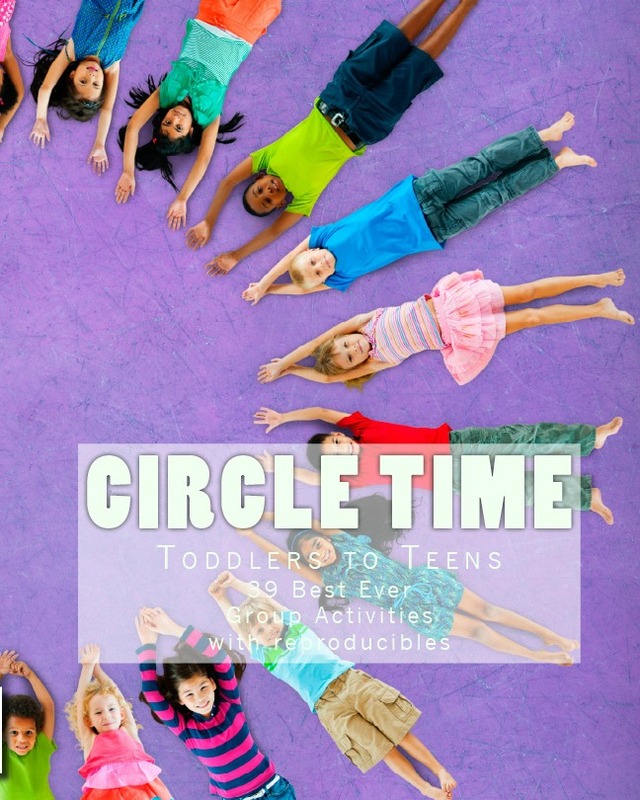 Read on to learn more about the best sleepover ever! *This is a sponsored conversation written by me on behalf of EVEREADY®. The opinions and text are all mine. It contains affiliate links. Have a pajama sleepover with spooky Scholastic Books and EVEREADY® Gold. Spooky Book for early readers, Scholastics, Ten Timid Ghosts. Before the party, we gathered supplies for our craft, snack, and pajama party tent. The kitchen nook worked best, because it has room for a large, family-size tent. We used the walls and bench to construct a tent from one of our favorite blankets. Mommy filled a basket with books, juice packs, popcorn, and flashlights. Then, we created some, super cute edible crafts- with a ghost theme of course. Candy Corn S'mores! 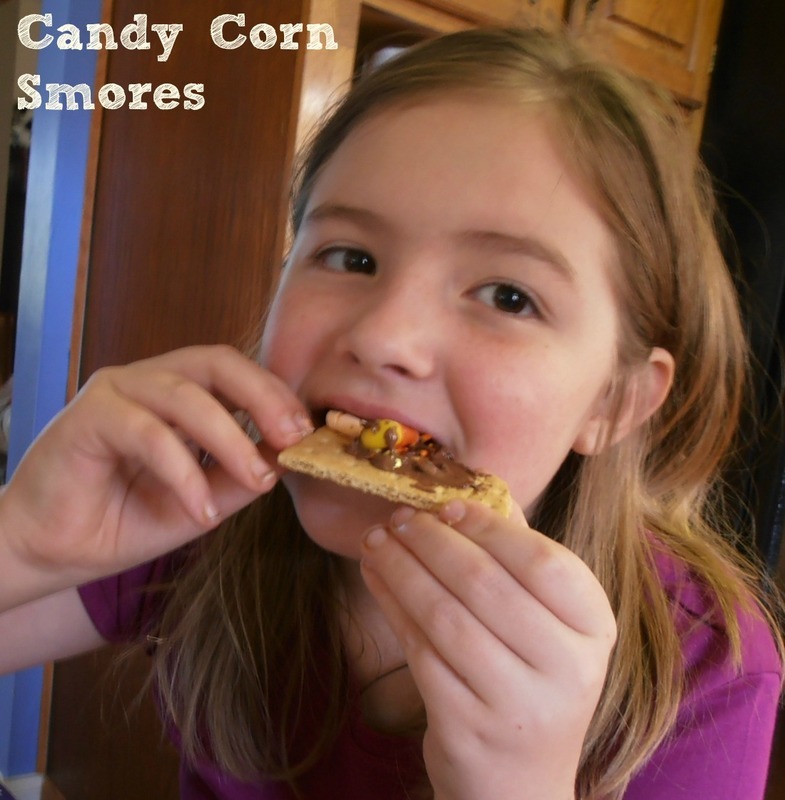 Candy Corn Smores Recipe: Make S'mores with candy corn and candy corn marshmallows. For our Candy Corn S'mores recipe, we used graham crackers, candy corn marshmallows, candy corn, and chocolate chips to make our S'mores. They were the best S'mores we ever had! Messy, but delicious. While our sleepover snacks were baking in the toaster oven, we started the spooky ghost craft. 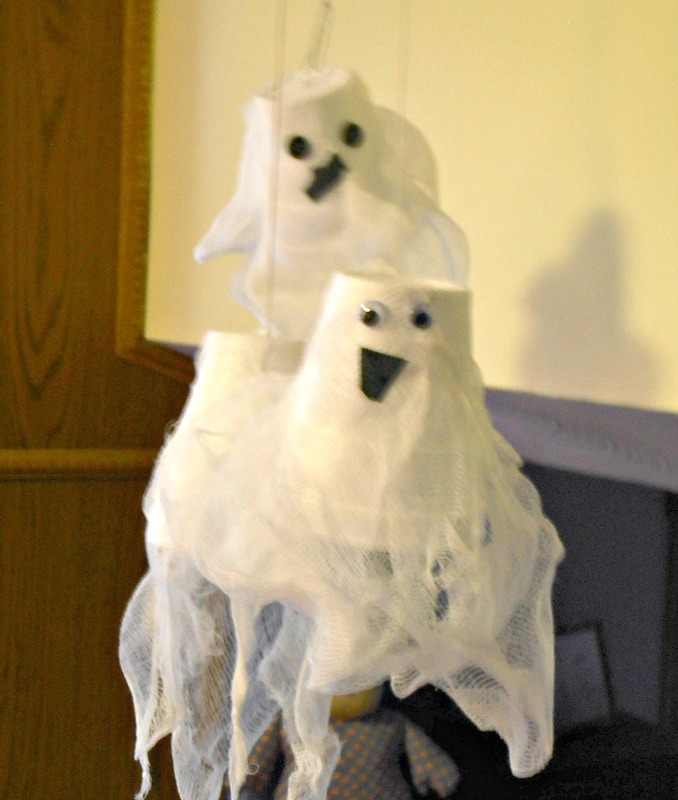 We used cheesecloth, Styrofoam cups, and buttons to make a Halloween Ghost craft. Spooky ghosts from Styrofoam cups. After reading the story, Mayhem wanted to make a bat too. So, we cut out a pattern that looks like the bat on the cover of the book. To make our bat you only need scissors, construction paper, and glue. If you want to make an outdoor Halloween decoration, before cutting, cover your paper with Duct Tape in coordinating colors. The duct tape will make a durable Halloween decoration for your door. While we enjoyed reading stories to each other and making shadow puppets on the walls, we had some surprise guests! 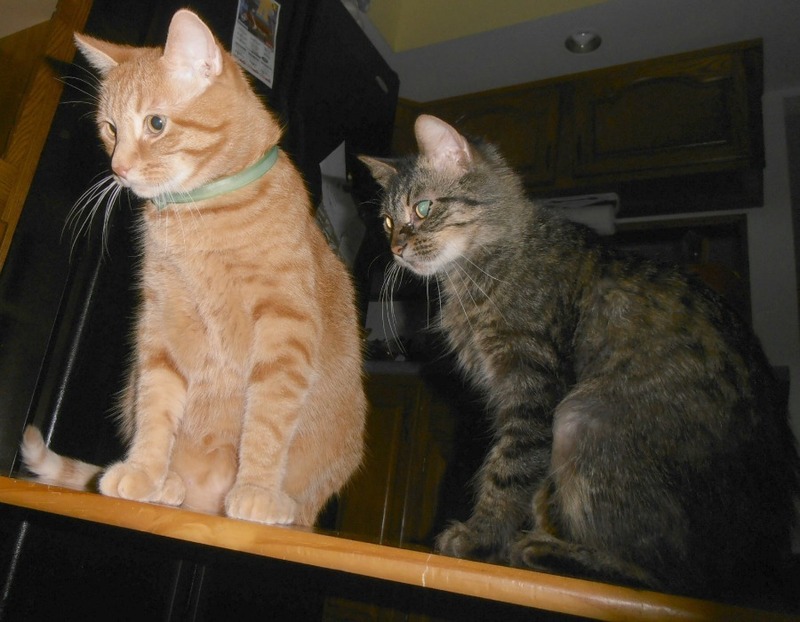 They wanted to hear about Splat the Cat, and they wanted to chase the lights from our EVEREADY® Flashlights! Curious cats crash our pajama party! 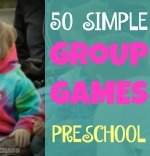 We wanted to count this experience as school, so we found a free printable story starter and Lesson Plans for, There Was an Old Lady, on Scholastic's website. From the list of lesson plans, we also chose to try the edible estimations. This is a fun math lesson for kids where you compare the things the old lady ate with similar weighing objects around the house or classroom and then calculate the grand total of everything she ate. The EVEREADY® website has free printables to help plan for a disaster. Grab your favorite Scholastic books, and EVEREADY® flashlights and get reading! When you purchase 2 special marked packs of EVEREADY® Gold Batteries or EVEREADY® flashlights, you can redeem them for a free book. How fun is that? 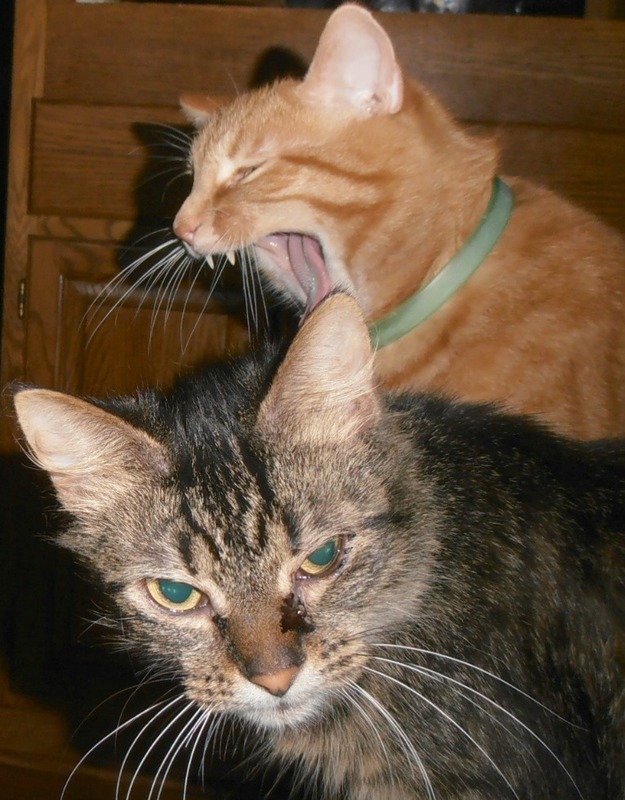 It must be time to go to sleep, our guests are yawning! Hey lady, don't shine that light in my eyes! Where are my pajamas? Those stories made me sleepy!